The Phoenician settlement sa Caleta, situated in the cove of the same name in the municipality of Sant Josep de sa Talaia, was founded at the end of the VIII century BC by Phoenicians from the East of the Mediterranean. 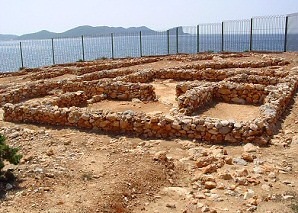 At end of the VII century BC or at the beginning of the VI century BC, after having set up an urban plan that occupied the whole part of the small peninsula on the SE of the cove, they abandoned the place and moved to the bay of Ibiza where they founded the city. Sa Caleta is the most important example of the beginnings of the Phoenician colonisation of Ibiza. The village was protected in 1993 as Heritage of Cultural Interest and in 1999, together with the fortified area of Dalt Vila, the Cemetery of the Puig des Molins and the prairies of Posidonia of the Natural Park of Ses Salines, was declared World Heritage by Unesco.